Hope you all had a terrific summer. I swam and soaked up as much radiant sunshine as possible. A couple of times, we all (my older daughter, the grandchildren and me) loaded into the van with a picnic lunch and made our way to Turkey Point on Lake Erie for the day. I had hoped to get up to Collingwood for the annual Elvis Festival but unfortunately, those plans fell through. Nevertheless, I had a wonderful summer and now I’m enjoying the cooler breezes indicating that fall is just around the corner. As some of you already know, my Gmail was hacked and temporarily hijacked a couple of days ago by some creative Nigerians, who decided to email my entire mailing list with a bogus letter. The letter stated that I was stranded in Nigeria with a hotel bill to pay and no money for a flight home, so would they cough up $2,000 to help me. This caused some real problems for me, as I received a few distress calls from worried friends. As a result, I spent most of the day trying to get back into my Gmail (which I did by changing my password), emailing all my contacts and notifying the proper authorities. So far, all seems fine but I have not heard back from any of those authorities yet. This month’s story comes from John Sperling, 54, of Mesa, Arizona. 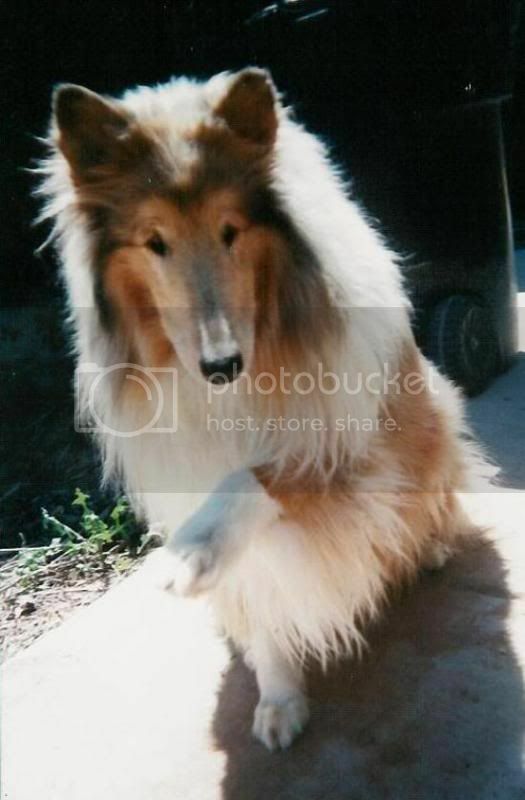 About five years ago, I had to put one of the best pals I have ever had down, due to his poor health. He was old and could no longer stand up in the rear or control his bathroom habits. We waited as long as we could but he was suffering, and with tears showing, we took him to the vet for what we all dislike to do. I have always hated this part of pet ownership because they had become such a part of my life. Rodeo was a true miracle of a dog for the kids, when growing up; very kind, he could handle anything, was protective of the kids, made a good pillow, and I loved him very much. By a stroke of luck we had had trouble selling him as a pup and so we decided to keep him around as part of the family; thank God. I have had Collies almost my entire life and couldn't live without them, so one more was no real problem. My wife laughs at me but I have always had a certain type of ESP (extra-sensory perception) with our dogs, some more than others, but looking into their eyes I just feel it inside. I know what they are thinking (it's in pictures of sorts mostly by the way), and they seemed to know my thoughts and moods as well. As a young boy, I had to have a pal to talk to and I’m not sure that I could have made it without one in troubled times. Someday maybe, I will write about my first pal Snow and how he helped me grow up. 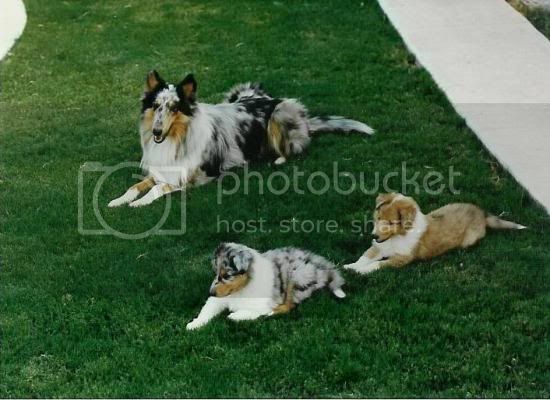 The above photo shows his three dogs: Babe, Merlin and Rodeo. When I was young, we buried our pets on the property when they passed. There was never any money for vets and such, and we had a special area for them to rest in peace... I hoped. It hurt to see them go like that but at least I felt we honored them at burial. It bothers me some that since adulthood, we have had the vet handle the cremation and we never know what becomes of the ashes. My house is not like my mother's old property with room for that, plus there is the money thing always in the way for something better, so I try not to think about it too much. I wish we could afford a larger place to live with land to set aside for them. Anyway, for the last week and a half, there has been scratching at the back door. I get up as usual to let one of the dogs in but there isn't one there. This went on for several evenings, often more than once a night and puzzled, I finally asked my wife if she had been hearing the same. When I told her that it sounded just like how Rodeo used to do it, she smiled and looked at me with that look of "what...are you nuts?" I know each dog's scratch - and it wasn't any of them, I told her but I had to check anyway. She shrugged it off as me hearing things (I am somewhat deaf) such as one of the other dogs that then walked away after, etc. The door is all small glass windows you can see through and I have heard the scratch but have seen nothing. I check anyway. You always hear or read about those stories of dogs that have found their way home after being separated from their family somehow after a move, a vacation or what have you. It is well documented that sometimes it is after a period of years before they find their way home. True miracles of love and devotion. Do you think it is possible that Rodeo has finally found his way home to me? Has anybody else had experiences with the spirit of a dog? I swear it sounds just like he used to do at the door. I'm interested in your thoughts on this. I am a bit baffled/spooked (?) as to what to do next, if anything. This is the first time something like this with dogs has happened to me, or my reluctant wife. If you have comments or suggestions related to this story, please send them to me and I will forward them to John. Bill Eagan is amazed by this photo, which was taken while his sister recently toured an old Scottish castle. "Look over the shoulder to the right of the people hugging. Best image at 200%. What do you think? Looks like a ghost of a small boy to me." Bill said he did some enhancing of the photo and didn’t even spot the child at first. He assured that this picture was in no way a trick and would like to know what others think of it. 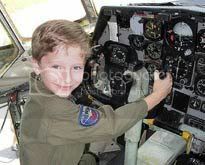 Eleven-year-old James Leininger says he’s the reincarnated soul of a WW II fighter pilot. Though his parents, were initially skeptical of this claim, they soon changed their minds, reports the Daily Telegraph. From an early age, James would play with nothing else but planes. His mom once gave him a pane with what appeared to be a bomb underneath it. James told her no, that it was a drop tank. She had no idea what that could be. At the same time, James began to have nightmares about being shot down while flying a plane. By the time he was 2 years old, these nightmares occurred three or four times a week. At 2, James also pointed to a picture in a book of Iwo Jima in the Pacific and said that was where the crash occurred. He was taken to see counselor and child therapist, Carol Bowman, who said she believed in reincarnation. With her guidance, James shared more memories of his previous life and his nightmares lessened. He also told his father that the boat he took off from was named the Natoma and that one of the fellows he flew with was Jack Larson. His father discovered that there really was a boat named the Natoma Bay and a pilot named Jack Larson, who currently lived in Arkansas. 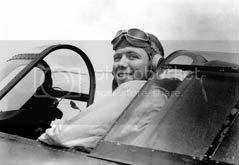 His father also discovered that only one pilot had died at that time: James M. Huston Jr., 21, who was shot down on March 3, 1945. 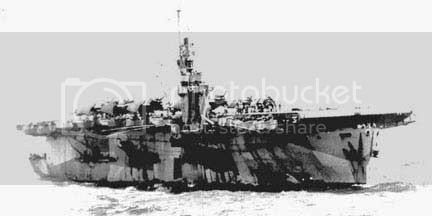 He search the Internet and military records, and even interviewed some of the men who served aboard the Natoma Bay. Rear gunner, Ralph Clarbour, said he flew right next to Huston during a raid near Iwo Jima on March 3, 1945. He said Huston’s plain was struck by anti-aircraft fire. “I would say he was hit head on, right in the middle of the engine,” he said. The youngster’s parents then sought out relatives of Mr. Huston and they were most impressed with the child’s memories of the war. Huston’s sister, Anne Barron said she was convinced because of all the information James knew and could not have known otherwise. James parents now believe whole-heartedly that their child was reborn. “He came back because he wasn’t finished with something,” his father noted. However, Prof. Paul Kurtz of the State University of New York in Buffalo feels differently. Though James is now older, he prizes two items that were apparently among Huston’s personal affects that were sent home after the war: a bust of George Washington and a model of a Corsair aircraft. There's a whole lot more news in this newsletter, so please go HERE!